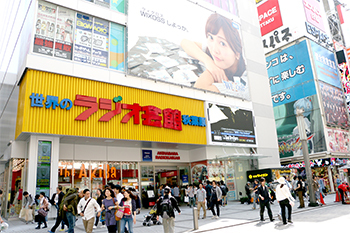 In 2003 we opened our first shop as a rental showcase in the “Akihabara Radio Kaikan”. In 2011 we opened our second shop in the “AKIBA Culture’s ZONE”. Now we have over 1600 showcases in our two shops. 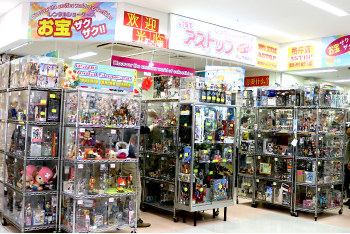 In the shops, several items are displayed together in each showcase; figures, stuffed animals, plastic models, idol goods and photos, retro games, trading cards and original products are all on display. We handle a wide range of genres. Our shop offers a service to private individuals with sought after collectibles to sell, to put their merchandise in to our showcases. The owners of the merchandise decide the price they wish to set. We then sell their items on their behalf. The showcase owner will pay a small sales commission on items and a usage fee for the showcase, to contribute to the costs of running our shop. 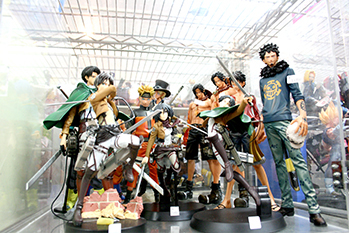 The type of items differ by owner, so you may find animation figures, comics, idol goods, and games from a variety of genres. Sometimes you may even discover a rare or hard to find limited item. 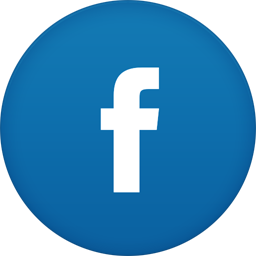 Unlike buying from an auction site or other Internet outlet, when you buy our merchandise you can verify the condition of it yourself, giving a much greater level of confidence in your purchase. Near the JR AKIHABARA station. Akihabara’s iconic “World Radio Kaikan “, there is a shop on the second floor which has in it over 700 showcases. These showcases contain famous anime from the world of “One Piece”, “Dragon Ball”, “Gundam”, recently popular anime such as "Tokyo Ghoul”, “Gintama” and“Fairy Tail”, various titles, figures and collectibles are displayed in each showcase. Occasionally you may find a rare item that isn't sold at a typical store. Would you like to open a big treasure chest? Our vast array of items provides the greatest opportunity for you to get your most treasured collectible. 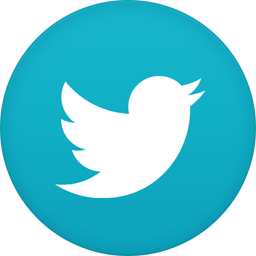 Please visit us; we are looking forward to seeing you. It was very easy to shop even when it was my first time. The shop staff was kindly and frankly explained and taught me. The shopping experience here, is like visiting an amusement park rather than just shopping. You will enjoy Astop even just watching a lot of showcases. QDo you accept credit cards? QDoes it come with a box? ABasically, it depends on the merchandise. We sell it to you as it is. If you are worried about taking it home, we will wrap it with bubble wrap. QDo you accept returns and refunds? APlease note that all merchandises are NOT refundable and exchangeable.